Nadex is the acronym of the North American Derivatives Exchange. Nadex offers retail trading of binary options and spreads on commodities, forex, stock indices and economic events from a single account and single trading platform. In this Nadex review we will see why this platform is the #1 for US traders. Nadex is a US regulated platform, where you can trade binary options. You can visit their website here. It is owned by the U.K based IG Group, a FTSE 250 global financial services firm. They have been in operations since before binary options became a buzzword. In business since 2009, they have helped the US market familiarize themselves with binary option trading. Nadex’s headquarters are located in Chicago,IL in the United States. Their business philosophy centers on the twin values of transparency and simplicity. In the binary options industry, we are used to dealing with brokers. Nadex is not a broker. Nadex is an exchange. There is a significant difference between a broker and an exchange. An exchange gives you direct access to the market, by matching buyers and sellers directly. Brokers are the go-between that connect you to their partners who then give you access to the market. An exchange offers many advantages over a traditional broker. The most important is transparency. Brokers use a number of routes to let you pitch in the market. The reputable brokers only pursue the ethical routes. Many others use unethical tactics. For example, a broker may take an opposite position to you (trade against you) in order to get you access. There is no way to know for sure when brokers use unethical practices. Which is why an exchange is a better choice. Nadex only makes money by taking a $1 fee per contract you enter into and $1 for each contract you close, offering you direct access to the market. Nadex makes no money when you lose. They do not take broker commissions. The company explicitly states the contract specifications for each asset they support on their website. You do not have to open an account to access this information. You will not find this level of transparency with most brokers. The binary options broker industry is awash with European-regulated brokers, many of whom have maintained excellent records for over a decade now. However, it is refreshing to have a US-regulated broker on the premium list of reputable brokers. Nadex is one of the only US-based CFTC regulated exchanges. The US regulator is the Commodity Futures Trading Commission (CFTC). The CFTC designates Nadex as a ” Derivatives Clearing Organization” and “Designated Contract Market”. As a CFTC regulated exchange, Nadex holds all member funds in segregated accounts in top-tier US banks—BMO Harris Bank, Fifth Third Bank. This level of fund protection is not offered by most regular binary brokers. To access the platform, all you need is a username and password. No download is needed (it is web-based). No platform access fees either. You get real-time indicative data. The Nadex platform is easy to use and well arranged. Additionally, you can customize it. For example, you can make a watch list to track the assets you prefer. It also offers robust charting and technical analysis tools. 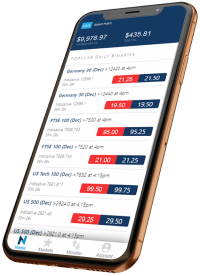 Nadex also has mobile versions of its trading platform for convenient, on-the-go trading. It is called NadexGo. The apps are available for i0S (Apple iPhones and iPads) and Android operating system. You can trade on Nadex on your Windows, Mac, or Linux PC, as long as you have a web browser and an internet connection. An awesome feature is its cloud multi-device sync. For example, you can place an order using the Nadex trader on your PC. Then later on, for example in transit, you can use the Nadex mobile platform to manage or exit the trade. TRADEX supports several assets in multiple classes. Furthermore, TRADEX even offers new asset classes in addition to the traditional classes. It offers assets in the usual Currency Pairs, Stock Indices, and Commodities classes. In addition, it offers assets in the Economic Events class and even allows you to trade Bitcoin. The expiry time differs between assets. Assets like Currency Pairs may have an expiry time of as low as FIVE (5) minutes, while assets like Stock Indices may have an expiry time of as high as ONE (1) week. Nadex offers four standard types of trader accounts. Opening an individual real trading account takes minutes. Nadex offers everyone a free permanent demo account that you can open in less than one minute. Literally! You only need to input your name, country, phone number, and email address to create a demo account. The Nadex demo account is a great way to try out this platform. Nadex offers multiple deposit and withdrawal options. Its minimum deposit is $250. Nadex charges a contractual fee of $1 to open a contract and another $1 to close a contract. However some exceptions exist. Nadex takes the standard contractual opening fee of $1 for only the first 50 contracts in an order. Thus, the contractual opening fee is capped at $50 when you make multiple contracts per order. Nadex charges no opening fee for all contracts after the 50th. Nadex does not charge the contractual closing fee of $1 if you let your position expire out of the money. Aside from contractual opening and closing fees of $1 each, the only other extra fees are the standard $25 fee for wire withdrawal and $25 fee for a returned check. Therefore, deposits and withdrawals are free except for the wire withdrawal. The $25 fee for wire withdrawal is the standard fee in the financial industry. Nadex boasts of an expansive learning center. Thus, it is very clear that Nadex is committed to ensuring clients succeed in the market. This is because it sticks to their bottom line. They make money when you open and close contracts. Accordingly, you wouldn’t keep opening contracts if you are largely unsuccessful. Therefore, it is in both in your interest and Nadex’s that you have long term trading success. You can contact Nadex via Phone and Email. Response is terrific in terms of both speed and how it addresses the underlying situation which prompted you to initiate contact. Is Nadex A Good Broker Or Not? As you can see in our Nadex review, the platform is awesome. The biggest appeal of Nadex is that it is an exchange and not another run-of-the-mill broker. That makes all the difference in the world of binary options. With Nadex you are certain that they are not trying to play a fast one on you. That certainty, complemented by simplicity and utmost transparency, makes Nadex a fantastic binary options company to choose for your trading activity. Its appeal is compounded by being regulated by the CFTC, offering services to US and non-US residents alike, record low fees, a robust trading platform, versatile asset classes giving you the ability to trade US and global indices, forex, commodities, economic events and Bitcoin; and a lifetime demo account. I’ve been practicing with the Nadex demo account, and I’m very glad it has only been imaginary money that I’ve been losing! Do you work with a trading software provider called “AUTO BINARY SIGNALS”? Do you mean if it’s compatible with auto binary signals? I don’t think it is.